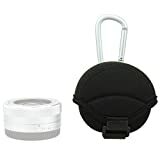 JJC Neoprene Lens Case offers a unique protective carrying system that is ideal for the photographer on the go. The case is made of elastic but durable neoprene to hold and protect your lens. The neoprene¡¯s thickness up to 5mm, thus provides great shock absorption for your lens. The inside also features a soft design to protect your lens from impact and scratches. The velcro allows you close the two parts easily. The case adopts a humanized design, the double lock design further keeps your lens securely in the case. In addition, there is a metal hook on the case, the hook allows you attach the case to a belt, a traveling bag or other places. This entry was posted in Discount Photography and tagged Black, lens, Mirrorless, Neoprene, Olympus, Pouch, Small, Sony by Ball Photo. Bookmark the permalink.